Tim Rowe (center) greeted visitors to the Cambridge Innovation Center, which he opened 15 years ago. It was a Thursday evening, and by 6:15 a crowd had already gathered on the fifth floor of the Cambridge Innovation Center, the shared office space that has hosted over 2,200 startups, including Android and Hubspot. 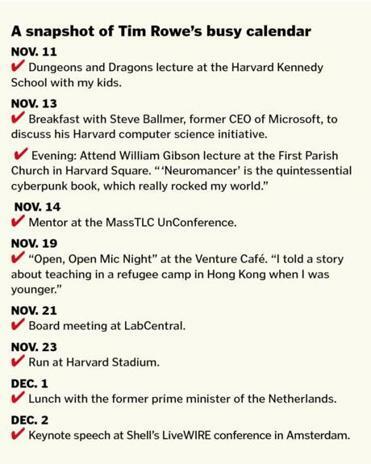 Rowe founded CIC 15 years ago, and he continues to map out his vision for Kendall Square there. 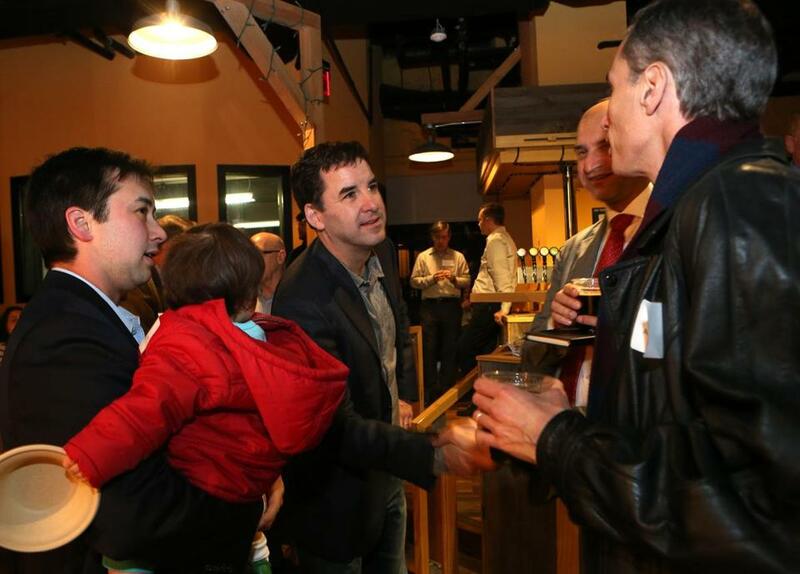 This night, like all Thursdays, was the Venture Café, a meet-and-greet where newly minted CEOs mingle with mentors. Rowe spotted a newcomer in the crowd and paused to walk her through the sign-in process: Enter your name, plug in your e-mail, and then tap your MBTA card on the scanner. “The next time you’re here, you can just tap your pass,” Rowe explained, as a machine spit out a nametag. Rowe can hardly be blamed if his number has plateaued as of late. In April, he opened the CIC Boston, a 60,000-square-foot shared office space downtown, and it has been just a few weeks since he opened CIC St. Louis, his first out-of-state venture and the largest startup space that is not on the East or West coast. Rowe was keen to cozy up to the Midwestern city’s startup scene: He saw promise in Washington University’s health care colossus and was tickled when Boeing opened offices in the 120,000-square-foot space — one of its first occupants. Lately, he has been shuttling to and from the Netherlands as he looks to take CIC global. But tonight he was back in his element. Rowe joined a circle of 1s at the bar, then ducked behind it to grab a bottle of white wine from the sommelier, Brian Wang of Locke-Ober fame, who hordes a secret stash. Seconds later, he reappeared with glasses, and a grin spread across his boyish face as he hoisted a toast to the new arrivals. Heidi Legg, of the upstart media site TheEditorial.com, was among them, and she looked around the room, scouting out locations for her first podcast, which she would host later that evening at the cafe. “Do you want to see the video conference room?” Rowe asked. She and her team followed his indigo blazer as he parted the scrum and opened the door to the studio, where an entrepreneur was pitching a pair of investors. None of the men flinched. Legg shrugged — the space was far too small — so they turned and maneuvered back through the crowd. A line pooled around the bar, so Rowe slid into another conference room, where young women from Boston University were in the midst of a pitch. Their concept: a pre-ordering system for local food trucks. Rowe rocked in a swivel chair, watching from the sidelines as the duo explained the idea to Martin Sack, a gray-haired volunteer mentor who advises entrepreneurs through the nonprofit Boston SCORE (his number: 27). After a few minutes, Rowe piped up: What’s the name of the company? Who will be responsible if there’s a food allergy? Is this a standalone app or will they choose to do a white label, licensing their idea to other companies? He didn’t think a white label was a very good idea. The students nodded and kept their game faces on, turning the pitch to Rowe. He listened and wished them luck as they shook hands. Correction: Because of a reporting error, the web site TheEditorial.com was misidentified in an earlier version of this article.